Kasturi Paigude, an Indian classical vocalist, will perform at Hope College on Wednesday, Oct. 23, at 7:30 p.m. in Wichers Auditorium of Nykerk Hall of Music. Paigude presented a solo concert at the college a year ago, in September 2012. This time the program will be a little different, including some film music as well as the classical repertoire. Also, the concert will include other musicians. Accompanying Paigude will be Amit Deshpande as a co-signer, Mandar Phadke as the Harmonium and Hemant Babtiwale on the Tabla. The concert will be a depiction of some raag structures presented in their pure form (Indian classical bandishes) and use of those raag structures in different formats like musical plays, film music and others. These aspects have led to a popularity of Indian classical music within the masses in the 20th century. The concert will also include narration in between the songs to talk about the innovations in classical music during that time and thus the evolving of music. Paigude has trained as an Indian classical vocalist in Agra Jaipur gharana for the last 20 years and has worked in the music industry in India for the last 10 years. Her career has included recording two commercial albums; performing in more than 400 live concerts in India and abroad, in the United Kingdom and United States of America; performing on the radio; performing on television as a graded All India Radio artist; and giving vocal lessons to more than 20 students. 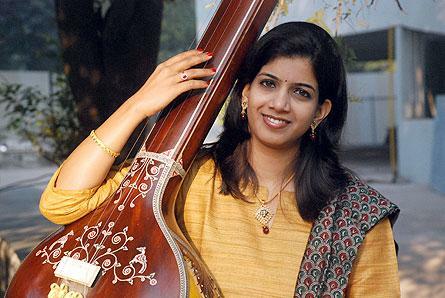 Currently, she is pursuing research on comparative study of compositions of Agra gharana from University of Pune, India. She has regularly contributed to music magazines and journals in India through music-related articles and papers. Deshpande has been learning Hindustani classical from Mrinalini Arkatkar, focusing on Khyaal Gaayiki for the past few years. He has performed in India and the United States at several Hindi, Marathi and also Telugu light and semi-classical concerts since 2007. He was a semi-finalist in the Brihan Maharashtra Mandal SareGaMa competition held in Boston in April 2013. Phadke has been learning Harmonium since the age of 10. He was a student of Dr. Vidyadhar Oke, who invented the scientific methodology of 22 shrutis in Indian classical music, and also had guidance from Pandit Govindrao Patwardhan for more than five years. Phadke has performed in various programs in India, Europe and the United States. He has accompanied various musicians in Indian Classical, Semi Classical and popular music. In addition, he was a founding member of Swaram, an organization to promote Indian popular music among youth in Michigan. Babtiwale began learning Tabla at age eight. His guru, the late Shri Prabhakar Desai, learned from the well-known Ustad Ahmadjaan Thirakawa and his disciples, and developed the art with combination of styles from Delhi, Farukhabad, Ajrada and Lucknow gharana. Babtiwale received the degree of Sangeet Visharad in 1980 with specialization in classical percussion from the Gandharva Sangeet Vidyalaya. He has performed on All India Radio, Nagpur and also in SPICMACAY concerts while in college, and accompanies local and visiting musicians from India. He also teaches students in Farmington Hills. In addition to the performers, the concert will include Suneetha Kodali as the Compere, or master of ceremonies. Kodali has been following music as a passion for the past 10 years. Guitarist Brian Morris will perform at Hope College on Friday, Oct. 25, at 7:30 p.m. in Wichers Auditorium of Nykerk Hall of Music. The Great Performance Series of Hope College will feature the Chicago Afro-Latin Jazz Ensemble (CALJE) on Thursday, Oct. 24, at 7:30 p.m. in Dimnent Memorial Chapel.